• Fully support all iPod /iPhone models: iPod nano (5th Gen), iPod mini, iPod shuffle, iPod classic, iPod touch, iPod touch 4, iPhone, iPhone 3G, iPhone 3GS, iPhone 4. • Fully supports iOS 4.2, iPhone 4 and iTunes 10. • Enable NVIDIA GPU acceleration which improves the performance and efficiency a lot. • Logon and look through top rated online videos sites, including YouTube, Metacafe, Dailymotion, Break, Vimeo, Revver, Blip, Vidilife and Stickam. • Preview and export photos and videos shot by iPhone conveniently. • Provides optimized profiles to convert DVDs/videos/audios to iPod/iPhone files. Automatically select a compatible profile for the imported file. • Simultaneously manage multiple devices without conflict by drag-and-drop to share your favorites with friends. • Convenient and effective to add files into the application, import one by one or the whole folder directly. Create new playlists and photo albums freely. • Proxy server configuration allows you to configure the network to your preference. • Simultaneously edit the ID3 information for multiple music files such as name, artist, album, and year. • Comes with a built-in resizable media player to preview your iPod/iPhone videos/music and DVD movies directly. 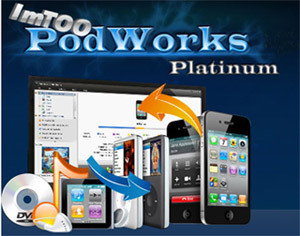 • Install ImTOO PodWorks Platinum on your iPod and easily use it anywhere. • Fast transfer speed for iPod to PC, iPod to iTunes, PC to iPod, and iPod to iPod file transfer.